A few weeks ago, the time came to process one of the pigs. Being raised on a hillside with part pasture and woods, the pigs consumed little feed with all the good stuff offered up to them by the field and woods. They are also given vegetable and dairy scraps from the kitchen. We like to offer them a little feed so we can scratch their backs while they eat to keep them tame and manageable. They were started off that way when they were piglets and looked forward to the back scratching. Our goal weight to process was 250 pounds. The university, where I work, has a small public meat processing facility so that is where I had the meat processed. There are quite a few processors around us so I bought a roll of breakfast sausage from four different ones so Boone and I could do a taste test. The cuts of meat (chop, ribs, etc.) are going to taste the same no matter who cuts it up but everyone has a different sausage recipe. 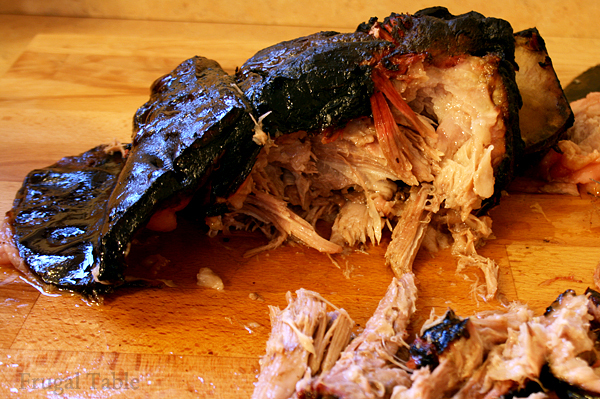 I could have made my own as there are plenty of recipes online but never having done it before I did not want to ruin many pounds of meat to get it right. Anyway, my university’s sausage was the best tasting overall. We wanted the whole process to be low stress for both us and the pig so we put the trailer in the pig pasture a few weeks before the processing date. 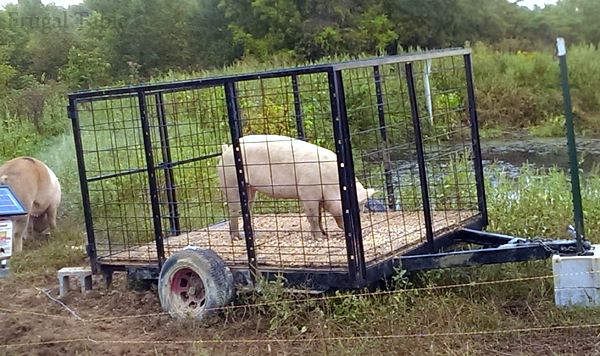 That way the pig would be used to the trailer and would hopefully load easily. Boone started putting the feed in the trailer and within a few days the pigs were hopping in and out easily. The actual loading went as we hoped, quickly with minimal excitement and stress. The cost of processing was $141.00. We received 147 pounds of boneless chops, ribs, ham hocks, tenderloins, sausage, leaf fat for lard, a whole shoulder, pork belly, jowls, steaks and other various cuts. I had talked with the manager ahead of time to discuss the cuts I wanted. When I picked up the meat all was vacuum sealed and already frozen. I cure and smoke our own bacon plus I had plans to smoke a shoulder to make barbecue, southeast NC style, so we put the pork bellies, jowls and shoulder in the extra fridge out in the garage to thaw. We picked this fridge up off of Craigslist for $50 and it has really come in handy.